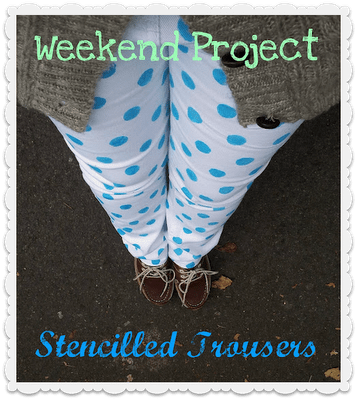 Ok so here we go with how to make the stencilled trousers. make sure you have all your supplies, see the previous post for a list of these. If you are using a pre cut stencil you can skip these steps. I made my own stencil out of a sheet of plastic from the front of a ring bound note book. Place your stencil onto one of the legs of your trousers, to get an idea of the spacing. Make where you want your polkadots to go. I would recommend drawing three lines of dots, so that you can cut out two and have the third there as a guide when moving the stencil. 3) Get your Fabric Paint Ready. I diluted my paint by about a 1/3rd to make it stretch further but also to make the colour a little lighter. Make sure you do a test if you plan to do this on darker coloured jeans. Pour some of the fabric paint into the second container and add a about 1/3rd of this volume in water (assuming your paint is water based) make sure it is mixed through thoroughly. Use a spare piece of material, preferably jeans material, to test how your are going to apply your paint. I cut a make up sponge down to almost the same size as my polkadots and used this to apply the paint. Make sure not to over load the sponge otherwise you will get the paint running under the stencil. Start at an edge, I used the bottom of one of the legs. Insert the second piece of plastic (or cardboard) into the trouser leg to stop the pain running through from one side to the other. 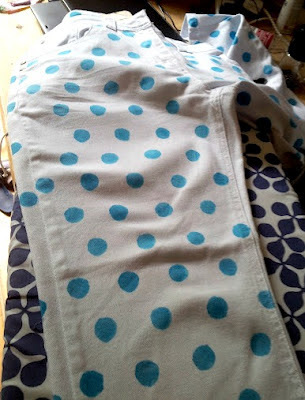 Line up the stencil with the hem and then start colouring in the dots. 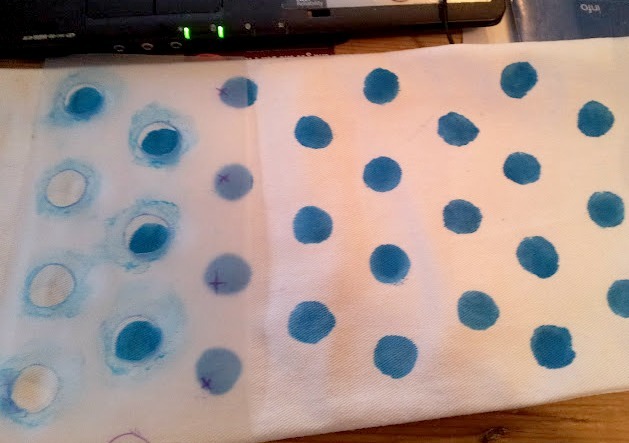 Once you have done one round with the stencil, move it up and line up the guides with the polkadots already painted. Work your way up the leg in a methodical fashion. Be careful not to overload the sponge as you don’t want the paint running under the stencil. Also if the stencil seems to be getting too covered in paint and is transferring to the trousers don’t be afraid to wash it down, just be careful to dry it off. Or what ever method is needed to set the paint you are using. This pair of trousers took me about two days to complete so be prepared to put some time into the project. But I’m sure many of you could do this quicker than me. I’m looking forward to seeing what everyone else comes up with. Let me see what you do.